ShoeStix are the solution to your stink. ShoeStix will quickly absorb moisture, eliminate the odor, and inhibit the growth of odor-causing bacteria. ShoeStix do not mask the smell… they work hard to neutralize it! 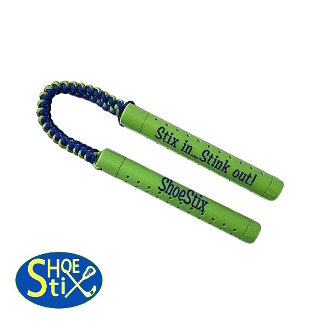 ShoeStix are designed to easily insert into shoes when they are not in use. You may use them with the handle attached, or remove it to make the stix a smaller size. Reduces odor in 24 hours. Antimicrobial protection lasts 10 years. Inserts last up to 6 months. 99.9% Effective at inhibiting harmful bacteria. Only Safe/Non-toxic and chemical free deodorizer of its kind. Can be used in skates, dance shoes, cheer shoes, gloves, helmets, lockers, and other athletic equipment that stinks.